Why book a Ceilidh band for a wedding reception or you're function? This for some can be a most daunting and time-consuming experience. You personally may already favour a certain style of music or type of band but .... will this suit your guests? What range of ages are going to be present at the wedding reception or you're function? What if the guest have never attended a Scottish Ceilidh Dance before? having the ability to read the audience and adapt our music to suit. What might be required musically at the start of an evening for example, might be totally different during, or towards the end of the night. From the time you are in contact with Whigmaleerie Ceilidh Band we will endeavour to suit you're needs and that of your wedding or function guests and you can be assured that we will have your best interests in mind at all times. 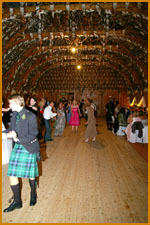 Some of the people attending our function have never attended a Scottish Ceilidh Dance? As Whigmaleerie are a live band (not relying on backing tracks) this gives us great flexibility when calling the Ceilidh dances for your guests. We can stop & start, speed up and slow down and generally have a bit of fun with the crowd as we Call the dance, this can be seen by viewing on some of our Live Video Clips. Please be aware that picture and sound quality vary on the video clips as they are from live performances taken on different types and quality of equipment. How long does the Band play for and what is the Cost? 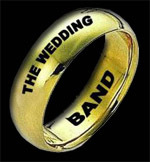 How long the Band plays for at a Wedding or function has to be assessed to meet the needs of the individual event. For Example; what time approximately will the meal finish, is tea or sandwiches being served at a specific time for the evening guests, is there a buffet being served through the evening, approximate start and finish time etc, etc. This can all be discussed and planned with the band prior to the event. Sometimes weddings, functions and other events may not run according pre-planned scheduals - do not panic. 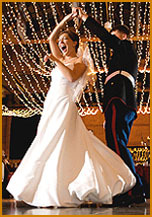 Whigmaleerie are experienced performers at weddings and functions and can easily adapt to any changes. The band will usually perform for 3 - 4 hours including breaks. This can be changed to suit our client's specific requirements. Costs vary according to the type of function, length of time we play, travelling, arrival & finish times. Locally (Aberdeenshire and Moray) the fee can vary from £800, however performances out with this area may require an additional amount to cover travel costs and accommodation. For a quote please Contact US to discuss your specific requirements.